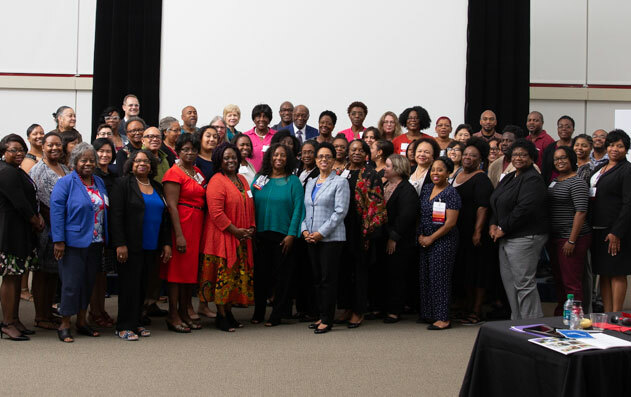 The directors and deans of libraries at Historically Black Colleges and Universities (HBCU’s) have been engaged in a dialog over the last eighteen months to determine ways of strengthening library programs and services through increased cooperation. This dialog has taken place through a listserv established for this purpose, individual discussions, and open forums at the 2001 and 2002 SOLINET Annual Membership Meetings. Participants in these discussions explored common opportunities and challenges that could be addressed through collaborative efforts among HBCU libraries. 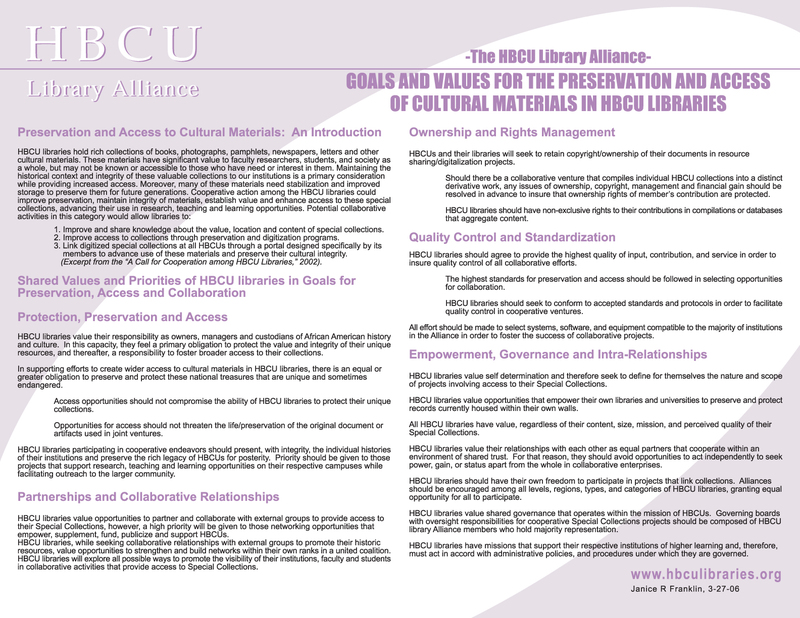 There has been consensus that increased cooperation among HBCU libraries could be effective in strengthening the role of libraries on our campuses, improving preservation of and access to the unique cultural resources, developing staff, and in sharing expertise and resources among libraries. This paper’s purpose is to summarize the ideas expressed thus far about potential cooperative activities in these areas, and to organize these ideas into categories as a basis for further discussion, brainstorming, and prioritization. 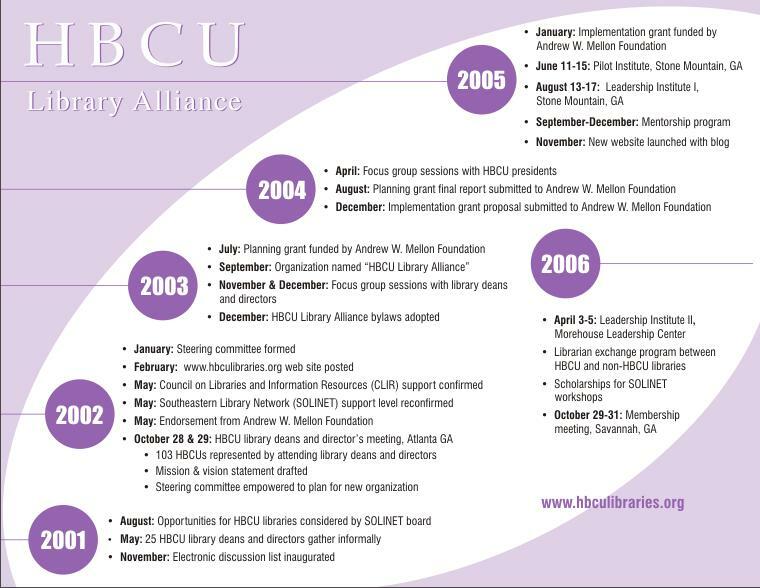 At our initial conference, the goal will be to establish agreement as to a plan of action for implementing cooperative activities and a potential HBCU library organization. Breakout discussion sessions will be held on these categories, as outlined below, at the HBCU Library Initiative Meeting in Atlanta , Georgia on October 28 and 29, 2002. 1. Improve and share knowledge about the value, location and content of special collections. 2. Improve access to collections through preservation and digitization programs. 3. Link digitized special collections at all HBCU’s through a portal designed specifically by its members to advance use of these materials and preserve their cultural integrity. 2. Analyze non-statistical factors of HBCU libraries, such as programs supported, expertise on staff, histories, etc., that would enhance libraries’ ability to work together. 3. Create a portal linked to the web pages of all HBCU libraries. 2 Develop programs to recruit and support the education of individuals to the library profession from among HBCU undergraduates, library staff, and other groups. 3 Explore cooperative activities, such as shared cataloging and virtual reference programs, that can address operational needs through shared expertise at multiple HBCU’s. 1 Create a virtual HBCU library collection by linking the catalogs of libraries and extending access to all HBCU faculty, students and researchers. 3 Offer cooperatively developed and maintained information literacy programs that increase use of collections. In conclusion, we ask your consideration of the above categories in order to determine an action plan for cooperation that will strengthen our libraries, our historic institutions, and our community of users.